Known only as “the City” to anyone within a few hundred miles, the real Gotham is as urban a place as you will find. A true cultural melting pot with over 800 languages spoken, 8 million people, and only 300 square miles, it’s one of the most stunning and demanding places anyone could ever XPLORE. The key to winning may just be remaining focused and not letting “the City” beat you, before you can beat it. Chi-Town has a deep history rooted in tough and resilient people. From the Gangsters that once ruled the city, to surviving a Great Depression and a Great Fire, to brutal winters along the Lake; those that call Chicago home are built to Urban Race. If the conditions deteriorate, we know the X-Racers of Chicago won’t, so expect to take on everything the city and XPLORE can throw at you. If you have any hope of winning you’ll have to figure out how to out-tough every other local in the race…and that’s gonna be tough. The Willamette Valley is home to some of the nation’s best Urban Racing teams. Often referred to as the “City of Roses”, don’t expect any teams to stop and smell them as they XPLORE PDX. The beautiful Northwest landscape, the temperate climate, and the countless number of outdoor pursuits make Portland a kind of Urban Racing training ground. If you’re an out-of-towner and expect to do well in this race, you’d better hope everyone else stays home. One of the oldest and most historic cities in the US, Boston and its people have always stood up for what they believed in, and they have never been afraid to go and get it. A tenacious group of Revolutionaries, they not only set the course for our country, but they made plenty of statements along the way. 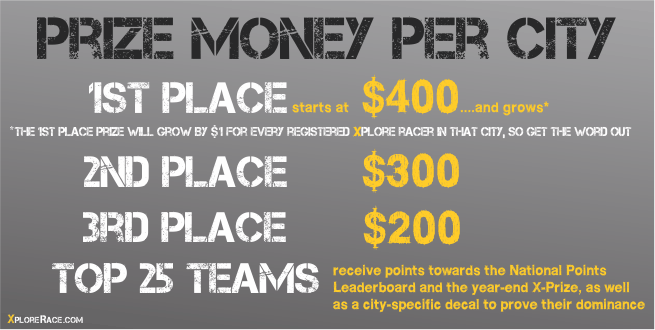 When XPLORE invades Boston in the Fall of 2013 we anticipate a strong uprising. If you expect to walk away having won the battle, you’ll need to put together the best team of combatants, in a city filled with them. Although the city of Denver rests along the foothills of the majestic Rocky Mountains, the people who live in the Denver area are rarely resting. Surrounded by 14,000 foot peaks, the country’s largest park system, and over 850 miles of paved trails, it’s easy to see why Denver’s residents are constantly ranked the “fittest in the nation”. In addition to brawn, Denver is home to one of the most highly educated workforces in the country. Oh, and one more thing…they do all this on a lot less Oxygen than anyone living in other XPLORE cities. If teams from Denver decide to travel, they will be a huge force before even stepping off the plane.